Many (dare I say most) Americans are unaware that attacks were made on U.S. soil during World War II. I only discovered the information in the last few years while conducting research for my stories. It certainly wasn’t taught during any of my history classes in school. 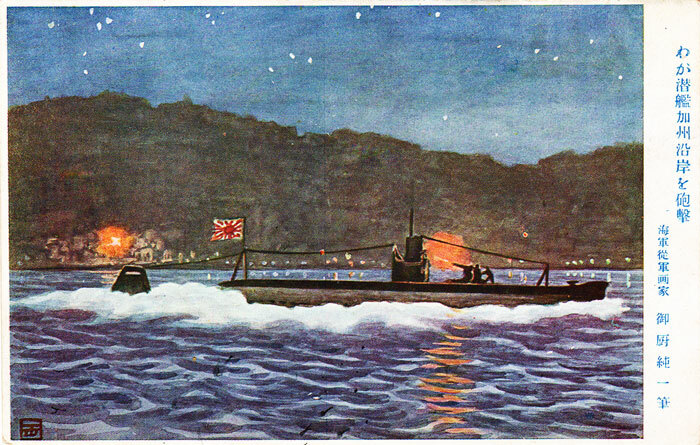 Following the attack on Pearl Harbor, Hawaii in December 1941, seven Japanese submarines patrolled the American West Coast. They sank several merchant vessels and skirmished twice with U.S. Navy air and sea forces. At the end of December, the submarines returned to friendly waters to resupply. On February 23, 1942, a lone Japanese submarine returned and slipped into a channel near Ellwood Oil Field, a large oil field well and storage facility outside of Santa Barbara, California. The vessel was captained by Kozo Nishino, a former merchant ship commander who had used the Field's fueling services prior to the war. At 7:15 PM he gave the order to surface then shot sixteen shells at Ellwood Beach from the sub's single deck gun before submerging and fleeing to the open ocean. There were no injuries, and damage was minimal - a derrick and pump house were destroyed. However, the attack led to public panic. Myriad witnesses reported seeing offshore enemy signal lights, and some newspapers referred to the incident as the "Bombardment of Ellwood" escalating the level of fear. The Federal government's internment of Japanese-Americans began a week later. The following year, an "Avenge Ellwood" fund-raising campaign was created for a war bond drive. 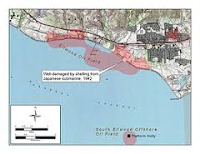 Today Santa Barbara County owns the site of the oilfield equipment damaged by the Japanese. The Sandpiper Gold Course is on the beach below the area. A historical marker is posted on a rock on the Golf Course grounds recounting the incident.